Turkey’s military says it has killed 307 Kurdish separatists in recent weeks, in a counterterrorism operation in southeastern Turkey. The growing toll on civilians in the region continue without much cry from the international community that considers themselves allies of Turkey. Rights groups, however, say 162 civilians, including 32 children, have been killed since August in districts where the military has imposed 24-hour curfews. This has caused a great deal of tension and revived the conversation about Kurdish demand for self-determination. Turkish president Erdogan and the leader of the Left-wing People’s Democratic Party, Selahattin Demirtas, in a public battle of words. Demirtas is Kurdish, and he leads the party that unites the Kurdish nationalist forces and Turkey’s left-wing groups. Let’s get more into this discussion with our next guest, Richard Falk. Richard is an international law and international relations scholar who has taught at Princeton University for over 40 years. Thank you so much for joining us today, Richard. RICHARD FALK: I’m glad to be with you, Sharmini. PERIES: So Richard, until recently, Demirtas and the HDP have called for more rights for the Kurdish population within Turkey, rather than for the creation of a Kurdish state outside of Turkey. But this situation is changing. Give us a sense of what the developments have been to revive the discussion on self-determination. FALK: Well, I think it’s a very complicated development that has brought the various tensions that exist inside Turkey into a sharp focus. You have to go back to the June elections, June of 2015, when the HDP scored a big success and elected 80 representatives to the Turkish parliament. This, in my view, made the PKK, the more militant expression of armed resistance to the present status quo, quite nervous. And they ended unilaterally the ceasefire. And this, this was rather surprising because at the very moment where the HDP triumphed politically, the PKK, which one would have thought would have been happy with this outcome, seemed to want to create a new phase in the conflict. At the same time, Erdogan, for his own reasons as president and leader of the AKP, dominant political party in Turkey, entered into a very acrimonious dialog with the HDP and the Kurds. Generally, they opposed his priority of revising the constitution so that he could become president. And he in turn was trying to bring more of the right-wing nationalists into a position of supporting him. They had been opposing him. So it’s all entangled with this internal political struggle that has been developing within Turkey, and has tragically revived the civil strife in Turkey between the Turkish state and military, and the movement for rights and some kind of self-determination, as you suggest. So it’s very difficult to clearly understand who is responsible for this escalation of violence. But I believe it’s–the Turkish government should at this point take a strong initiative to create a new ceasefire coupled with a renewal of the effort to have a, a peace process that would, that produced some kind of solution. PERIES: Now, in late December, Richard, Demirtas backed a resolution passed by the Kurdish Democratic Society Congress, known as the DTK, which reiterated an old demand that they have had for the creation of a Kurdish autonomous region, and for self-governance. So now, is this, is this real in terms of the demand for autonomous state, and is Erdogan reacting to this by using more military force? Obviously we see indication of that. But is there not a sort of Democratic process in place here to deal with the, the Kurds within the Turkish state? FLAK: You raise important questions that, again, are hard to disentangle from the wider problems involving Syria and Iraq. I think one of the background developments that’s very important for an understanding of what’s happening today is the fact that the Iraqi Kurds and the Syrian Kurds, both have succeeded in establishing at minimum autonomous regions. And more realistically, they’ve established de facto states. I think the PKK particularly, when it saw this happening, was unwilling to settle for the minimum kind of solution based on increasing Turkish cultural and political rights, and the protection of human rights. So the demand that you refer to in December is, I think, an outcome of this wider set of developments that made it seem unfortunate for the Kurds to settle for less than what the Iraqi Kurds and the Syrian Kurds had achieved. And that caused a, I believe, a sharp split within the Kurdish movement between those that wanted a militant approach to the confrontation with the Turkish state, and those who were more prepared for an accommodationist approach that didn’t renew the kind of civil strife that existed in the 1990s. PERIES: Richard, this, you know, you referred earlier to the election that took place this summer when the Kurdish party, allied party, gained more seats and had a level of confidence. That grossly diminished in the last election when Erdogan was reelected to power, and they lost the support that they had from that previous election. So does that have a lot to do with this resurgence of the demand for a separate state? FALK: Well, I’m not sure, because they, they were still above the 10 percent, which enabled them to have quite a large delegation of HDP parliamentarians. Not quite as large as the 80 in June, but the November elections, I believe it was 60, something like that, or maybe even a little less, but it was still substantial. I think one has to understand that the HDP found itself squeezed between these two elements in the Kurdish movement. Those that were pressing for what one might call a maximalist outcome of autonomy or de facto statehood, and those that were satisfied with an increase in protection of human rights and participation in the Turkish political framework through elections and their enhanced role in the parliament. PERIES: And Erdogan is on record just recently as saying that, that Syrian Kurds do not want Iraqi Kurdish peshmerga fighters to help them fight the Islamic jihadis in Kobani. What does this have to do with what’s going on in terms of this whole Kurdish–the revival of the Kurdish autonomy discussion? FALK: Well, I think has probably quite a lot to do–I think Erdogan was very worried about some kind of unification of the separate national Kurdish movements. And therefore it would be very detrimental to his vision of a unified Turkish state for the Kurds to seek a Kurdistan that was ethnically constituted, and didn’t respect the existing national boundaries. That was what the World War I diplomacy 100 years ago had in mind when they initially established an ethnic Kurdish state that didn’t have these boundaries that divided the Kurdish people into four separate countries. PERIES: That is a very good point. However, these separate Kurdish movements have both an objectives of their own. They’re not a unified force, here. What are the differences, and do you think they’ll be able to pull together a autonomous state, given the differences? FALK: Well, I think it’s very difficult to challenge the political boundaries that exist, though it’s far from inconceivable that what we have known to be Iraq will divide into two or three different political communities. We have to remember that all of these states in the Middle East were artificially created to satisfy the colonial ambitions of Britain and France. The Sykes-Picot agreement in 1916 was a way of carving up the legacy or the remains of the Ottoman Empire. And much of the grief in the region can be traced back to those artificial political communities that were imposed without respect for the will of the people or their ethnic and historical experience. So what will happen now in this situation of fluidity is extremely difficult to assess. And no one who comes with very clear answers should be trusted, in my view. PERIES: And what significance is ISIS having now in terms of the Kurdish self-determination movement? Are they feeling threatened by ISIS, and does it look like it’s going to fracture in any way as a result of ISIS? FALK: Well, I think ISIS is, accentuates all of these issues, and makes the contradictions in the region very bewildering to probably those that are active there, and certainly to outsiders. ISIS and Turkey are both on record as being committed to the overthrow of the Assad regime in Damascus, Syria. 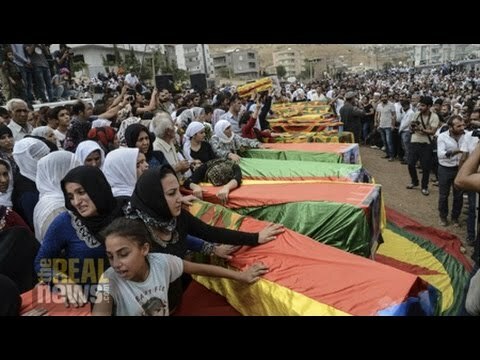 And at the same time Turkey is being attacked by ISIS through these terrorist incidents that have been occurring, most recently just a couple days ago in Istanbul, so that you have a situation where ISIS has been generally anti-Kurdish because the Kurds have challenged ISIS in various places, including Kobani. And that was, in a way, one of the flash points that has led to this much-escalated Turkish-Kurdish confrontation. PERIES: All right, Richard. This is obviously an ongoing discussion. We must continue as things unfold, and we look forward to having you back. FALK: Well, thank you, Sharmini. I appreciate your questions. Why Did Turkey Go Public With Murder Accusation Against Saudis Royals?